This weekly figure drawing class will explore various methods of observation to accurately represent the human figure. Working on one drawing over multiple sessions, students will start by learning how to translate the proportions and gesture of the model onto paper. On this foundation the class will then study key anatomical structures, as well as the creation of form through light and shadow. Each class will begin with a short discussion on various topics such as anatomy, movement, perspective and light paying particular attention to how these ideas are used in the drawing process. After this, students will work on their own drawings guided by one-on-one critiques. This class is intended for all levels, and instruction is tailored to the individual student. In the Portrait Painting Techniques Workshop , students will investigate the foundational elements of portrait drawing and painting. The workshop will allow for 2 6 hour sessions with the same model so that each aspect of the curriculum can be thoroughly studied and implemented. Students will begin with a study of basic proportions of a live model, then learn how to transfer that information to a two-dimensional surface. The class will then progress to the articulation of form by means of light, perspective, and structure. By moving from the simple to the complex, students will gain a greater awareness of these foundational elements and their implementation in portrait painting. In addition, topics pertaining to anatomy, design and color will be presented and tailored to the needs of each student. Lessons will take the form of demonstrations and individual critiques according to each participants needs. This weekly figure drawing and painting class will explore various methods of observation to accurately represent the human figure. Working on one drawing or painting over multiple sessions, students will start by learning how to translate the proportions and gesture of the model onto paper or canvas. On this foundation the class will then study key anatomical structures, as well as the creation of form through light and shadow. Each class will begin with a short discussion on various topics such as anatomy, movement, perspective and light paying particular attention to how these ideas are used in the drawing and painting process. After this, students will work on their own drawings and paintings guided by one-on-one critiques. This class is intended for all levels, and instruction is tailored to the individual student. In this class participants will investigate the foundational elements of portrait drawing. During the course of five sessions each student will construct one portrait so that each lesson can be thoroughly studied and implemented. Beginning with introductory strategies on how to effectively place the proportions of a live model onto paper. The class will then progress to the articulation of form by means of light, perspective, and structure. By sequentially implementing simple to complex concepts students will gain a greater awareness of these foundational elements and their implementation in portrait drawing. In addition, topics pertaining to anatomy and design will be presented and tailored to the needs of each student. Lessons will take the form of demonstrations and individual critiques according to each participant’s needs. In Foundations of Creating Space, is a course designed to teach you how to create real space in your paintings. It provides a survey of important concepts for depicting space. An artist always utilizes a collection of visual concerts in the creation of a drawing or painting and this class is designed to expound on some of the most foundational concepts of representational art. Topics such as linear perspective, color theory and light will be the primary topics of discussion. Students will focus on three main concepts in figure drawing during this course: proportion/gesture, perspective and lighting form. Each session starts with a drawing demonstration by the instructor and an exercise for participants to practice. Students will then work from a live figure model for the rest of the session while receiving individual guidance from the instructor. This class is designed to break figure drawing down into clear ideas to create definitive goals so noticeable progress can be gained. By working with clear objectives students should expect to see significant growth in their work. Session 1: Proportion/gesture, through exercises and practice students work to train their eyes to see proportion and gesture more clearly giving their figure drawings a more natural feel. Session 2: Perspective, students add linear perspective to their drawing to make their figure drawings appear to occupy space and have depth. Session 3: Lighting, while a large subject, students will learn how light falls on form and how that can be used to enhance the drama in their work. 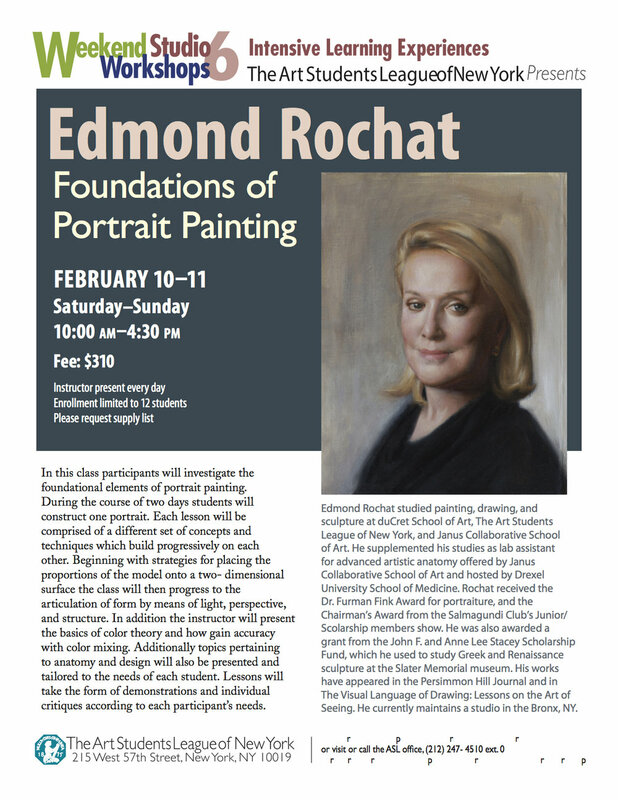 In this class participants will investigate the foundation elements of portrait painting. During the course of four days each student will construct one portrait. Each day will be comprised of a different set of concepts and techniques which build progressively on each other. Beginning with Introductory strategies on how to effectively place the proportions of the model onto a two- dimensional surface the class will then progress to the articulation of form by means of light, perspective, and structure. In addition to these fundamental concepts the instructor will supplement the lesson with the use of materials when pertinent. additionally topics pertaining to anatomy and design will also be presented and tailored to the needs of each student. Lessons will take the form of demonstrations and individual critiques according to each participant’s needs. In Structural Figure Drawing, we will focus on the simple geometric solids that are an important supplement of an artist’s thinking in order to draw and paint with accuracy and efficiency. In this class students will study the basic geometric structures and their application to the human body. The first three lessons will consist of drawing from geometric solids such as the cube, cone, sphere and cylinder. Careful attention will be given to their unique architecture and how to effectively model each form in charcoal. Then working from a live model these geometric solids will be applied to the forms of the body with special consideration given to the portrait. Through these investigations students will become sensitized to how the most basic geometric forms can help simplify and clarify the complexities of the human body. In this class participants will investigate the foundational elements of portrait drawing. During the course of four sessions each student will construct one portrait so that each lesson can be thoroughly studied and implemented. Beginning with introductory strategies on how to effectively place the proportions of a live model onto paper, the class will then progress to the articulation of form by means of light, perspective, and structure. By sequentially implementing simple to complex concepts students will gain a greater awareness of these foundational elements and their implementation in portrait drawing. In addition, topics pertaining to anatomy and design will be presented and tailored to the needs of each student. Lessons will take the form of demonstrations and individual critiques according to each participant’s needs.